Met up with Tony Long and the T&F crew today and to our surprise Van Homan and some of the 2x4 guys came along for the day trip. We started off at the Middlefield Park and the local skaters weren't too psyched. Eff em! We rode and dudes were having fun. Mid-day we headed over to the snake run and people were stoked. That place truly is a gem! Everyone was getting rad, taking white knuckle bomber runs, and having a good time. There were a few casualties, but nothing my zip loc bag med kit couldn't patch up. 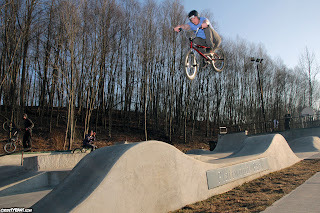 We topped the day off down at the Deep River Park and Van Homan owned the place jumping the humps....then throwing a turndown over them. All of us have been eying that up for years, I was psyched to see it go down. All in all it was a fun as hell day with a bunch of great people. Thanks to the T&F guys for venturing over 2 hours once again and thanks to the 2x4 guys for making a pit stop in CT. Always good to ride our local places with new faces.